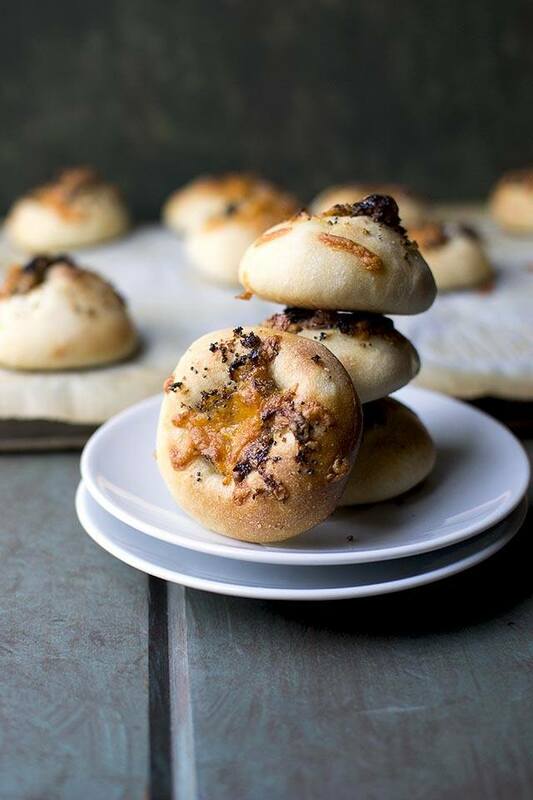 These caramelized onion and cheese mini Bialys are chewy and delicious. They are great to serve warm but taste amazing toasted with some cream cheese. Combine all the ingredients for the pâte fermentée in a mixing bowl. Mix until a shaggy dough forms; cover with a plastic wrap and let stand at room temperature for 30 minutes. Refrigerate the mixture for at least 8 hours and up to 24 hours. Combine the water and flour in a mixing bowl or the bowl of a stand mixer. Let it rest for 20 minutes. Next add the pâte fermentée (straight from the fridge -- no need to bring to room temperature), yeast and salt -- mix until all the ingredients are well combined. Add a little more water if needed to make a smooth, pliable dough. Knead for 7 (on mixer) ~ 10 minutes (by hand). Transfer the dough to a clean bowl. Cover and set aside for about 1½hours or until doubled in volume. Heat oil in a large skillet on medium-low heat. Add the onions and cook, stirring occasionally, until the onions just start to brown and have reduced in volume, about 15~20 minutes. Transfer the onions to a bowl and stir in the bread crumbs, poppy seeds and salt. Set aside to cool. Transfer the dough to a lightly floured surface. Divide the dough into 12 equal pieces. Form each piece into a small bun; cover with plastic wrap and let rest for 5 minutes. Once all the pieces have turned into buns, proceed in the same order in which the pieces were shaped into balls; flatten each ball with the heel of your hand into a disk about 2" diameter. Place the disks on the back of a baking sheet that is lined with parchment paper. Loosely cover with plastic wrap and set aside for 1~1½hours. Preheat the oven to 500°F for at least 30 minutes. Uncover the bialys and using the index and middle fingertips make a depression in the center of each disk of dough. Put about 1tbsp of the filling and a tiny bit of cheese on each bialy. Bake until golden brown, about 12~15 minutes. Transfer to a wire rack to cool for a few minutes. Serve right away. Leftovers can be kept in an airtight container at room temperature for up to 2 days.